Richard is a graduate of the Whittington Hospital NHS Trust Psychosexual programme and was amongst the first cohort of students to qualify. 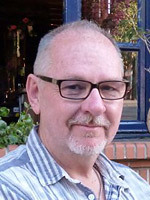 Richard is a COSRT & UKCP registered psychotherapist, a clinical supervisor and counselling trainer who works with individuals (including adolescents), couples and groups and specialises in relationship issues, abuse and trauma primarily in London. Richard is involved with a variety of agencies where he offers clinical supervision, mentoring and training. Although he has trained in a wide variety of psychotherapeutic models it is his ability to blend Gestalt, Psychodynamic, CBT and EMDR into his work that allows him to work in a truly inclusive and integrative way. He is currently working in private practice and at The Tavistock Clinic. Richard is a compassionate, yet challenging, practitioner who demonstrates a high degree of insight and empathy in his role as an educator which allows him to deliver instructional material in a practical, accessible and thought provoking way.